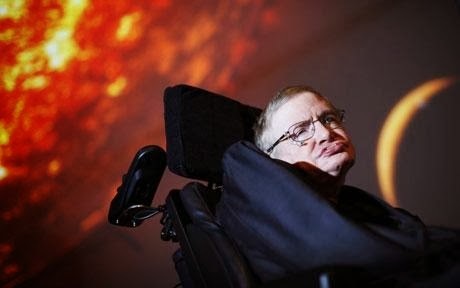 I'm not sure why, but Stephen Hawking has been on my mind this week. I think it was probably sparked by seeing a trailer for the new documentary film about him before the screening of "Rush" that we saw at the Broadway on Saturday evening. I nearly went to watch the film itself earlier this evening, but the screening was just too early to make it practical. You really don't need me to tell you that he's a remarkable man. He was told fifty years ago that he had a life expectancy of two years at best, and he has been defying those expectations ever since, also refusing to allow the indignities of his physical decline to hide the brilliance of his brain. It's still somewhat astonishing to think that a theoretical physicist could sell something like nine million copies of a book at all, never mind one with so much else to overcome. "I have lived with the prospect of an early death for the last 49 years. I'm not afraid of death, but I'm in no hurry to die. I have so much I want to do first. I regard the brain as a computer which will stop working when its components fail. There is no heaven or afterlife for broken down computers; that is a fairy story for people afraid of the dark." I have no way of knowing if he's any more right about that than he is on his work explaining the development of irregularities in a single bubble inflationary universe... but just as I broadly agree with his conclusions on the single bubble inflationary universe*, I tend to agree with his thinking here too. Why would we be so afraid of the idea that this life is all there is? That when we die there is nothing. Why not embrace the idea? Isn't that a profoundly beautiful thought? He likes talking metaphorically, I think... and bless him, that adds ambiguity. I don't think he really means that people who believe in the afterlife are actually afraid of the dark. It's a metaphor, you see. And as for talking about the "grand design of the universe"... well, I think he's being deliberately mischievous. Designs need designers, you see..... Stephen Hawking, you little tinker!